I was looking at FamilySearch’s historical records section over the holidays and noticed that the Soundex cards for Cook County naturalization were added on December 22. 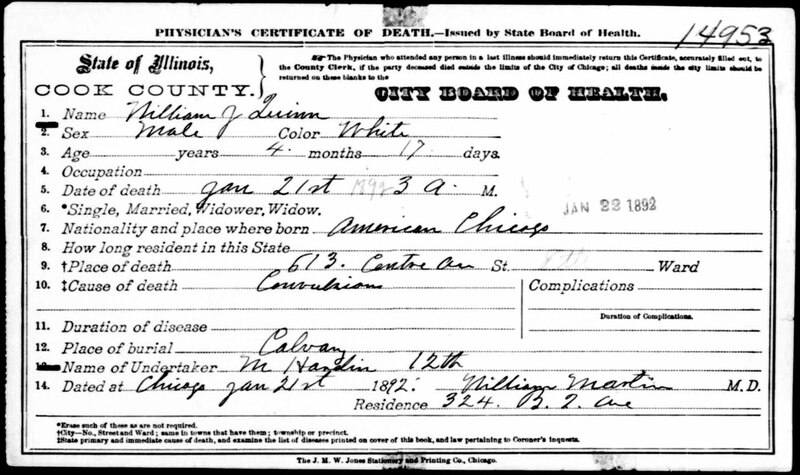 Now that they’re online for free, it seems like a good time to talk about Cook County naturalization research. 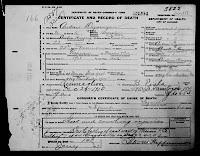 In this post, I’ll focus on finding the records, but I’ll try to share some of the interesting things I’ve discovered about the Cook County naturalization process in another blog post soon. 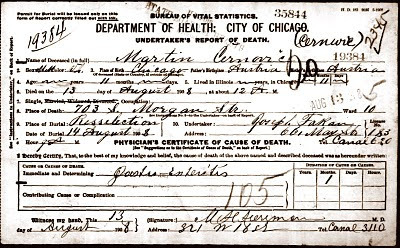 If you're looking for Chicago and Cook County naturalization records you'll want to begin with the Soundex index to naturalization petitions for U.S. District & Circuit Courts, Northern District of Illinois and Immigration and Naturalization Service District 9, 1840-1950. (I just call it “The Soundex Index.”) It’s the same as NARA publication M1285 and it includes entries for people who naturalized in northern Illinois, northwestern Indiana, southern and eastern Wisconsin, and eastern Iowa. There are two places to access the index online. 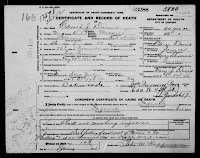 If you have an Ancestry.com subscription you can search the cards by name, year of birth, year of arrival, and state of residence in U.S. Naturalization Record Indexes, 1791-1992 (Indexed in World Archives Project. 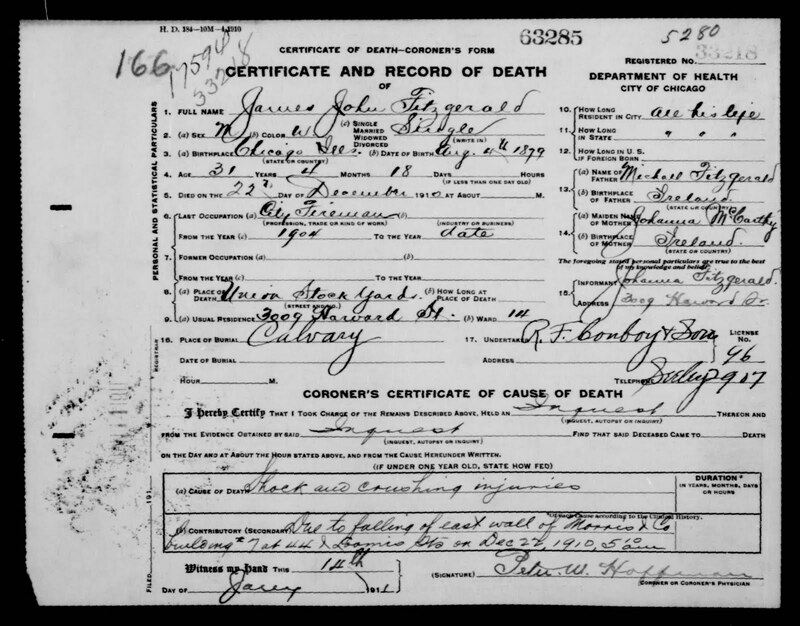 If you don’t have an Ancestry subscription, you can now browse the cards for free at FamilySearch.org. 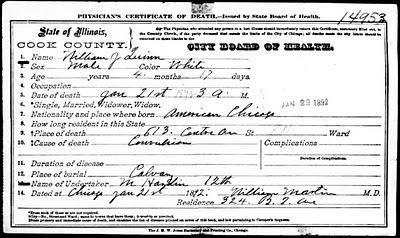 They’re included in the historical records part of the site in a database called Illinois, Northern District Naturalization Index, 1840-1950. 1) Use the Soundex converter at Rootsweb to find the correct Soundex code. Type in the surname, hit the "Get Soundex Code" button and you're done. Example: B-653 Tekla to C-124 means that section will include B-653 surnames with given names starting with Tekla and run through the end of the C-124 given names. 3) Find a card with the correct given name using a high-low number game strategy. 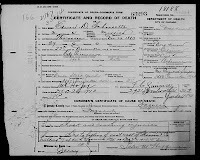 There are 6586 cards in the section that would include Charles Berman (B-655). I'd type 3000 in the image number box to get my bearings. The corresponding card is B-656 with a G given name so I'd try a lower number. Typing in 1500 brings up a card for B-655 with a J given name so I'd try again. Typing in 700 brings up an A given name for B-655. The number 900 brings me to a B-655 card with the name Charles John. If I chose that as my starting point I'd page through the images going backwards until I had exhausted the entries for Charles or similarly-spelled names and then I'd return to image 900 and page through going forward if I hadn't found the match. The introductory pages to this index remind researchers not to overlook "initials, alternate spellings, and "old country" versions of names." Good advice. 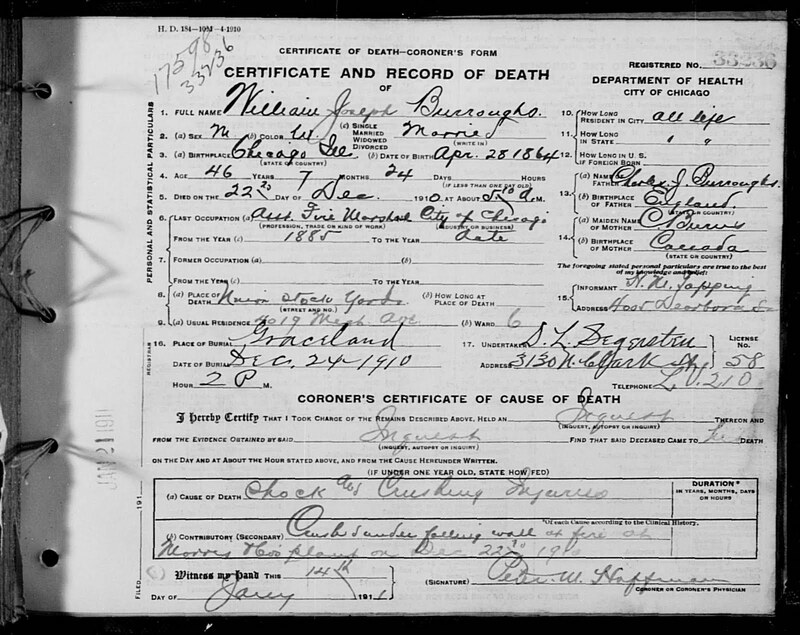 Once you’ve found a card and saved it to your computer, you’re ready to locate a copy of the corresponding naturalization record. Check the court. If it says Circuit, County, Criminal, or Superior, the original records are at the Circuit Court Archives. If it says District, the original records are held by NARA. Records from all the courts are also available on Family History Library microfilm. 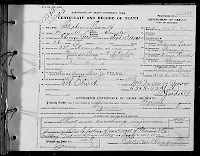 I can suggest four ways to get naturalization records from the Circuit Court Archives. 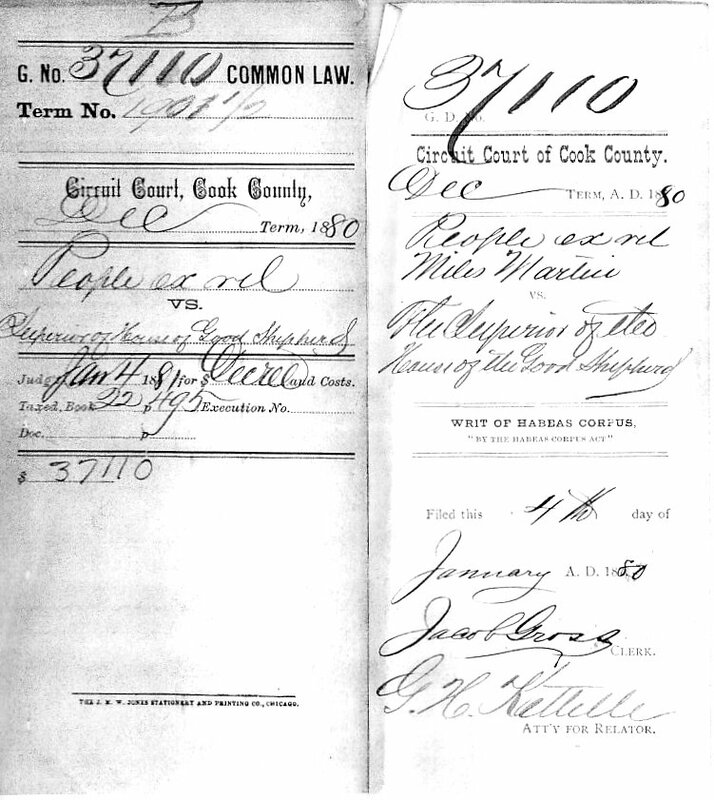 In Person: The Circuit Court Archives has the Cook County Naturalization records from the Circuit Court, County Court, Criminal Court, and Superior Court. If you live in the Chicago area, you can visit their office on the eleventh floor of the Daley Center to view the records (free) and obtain photocopies (minimal fee). The office is easily accessible from the L and the staff is very helpful and friendly. By Mail: If you can’t visit in person, you can request the records by mail, but it’s a two-step process. Once you submit the order form the office will bill you for the copies and then send them out when payment is received. The cost is $2.00 for the first page and $.50 for each one thereafter (a naturalization record would have just a few pages at most) + a $15 mailing fee + postage. 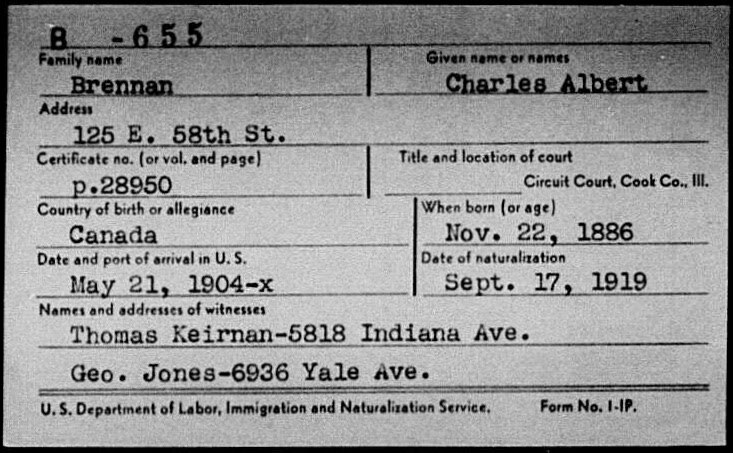 From Family History Library Film: Using the new catalog at FamilySearch, pull up records for “Cook, Illinois” and then narrow the search by clicking on the link for Naturalization and Citizenship. 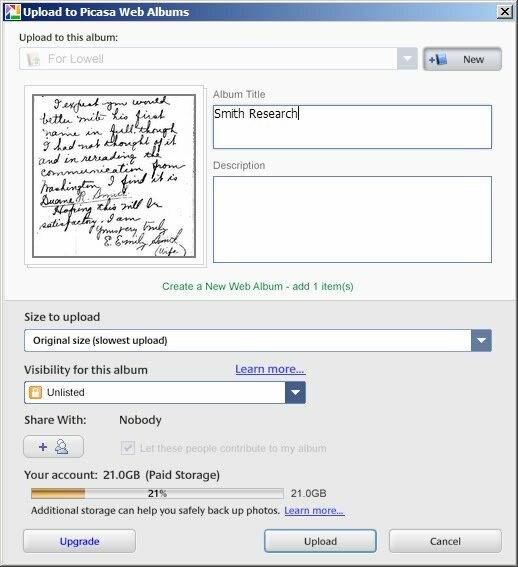 This will bring up a list of available records and once you’ve identified the correct reel you can order it in at your local Family History Center. From a Local Researcher: If you don’t live in the Chicago area, it might be quicker and/or easier to request a lookup from a local researcher rather than ordering by mail or ordering FHL films. I can retrieve naturalization records at the Circuit Court Archives if I’m going downtown (send me an email) or KimStankiewicz offers the service through our Genlighten.com website. If the court is listed as District, then the original records are kept at the National Archives and Records Administration’s Great Lakes Regional Archives, 7358 S. Pulaski Road, in Chicago. In Person: If you’re going to go in person, contact them ahead of time to double-check the search procedure. I have next-to-no experience doing research at NARA but it took a couple of visits for my husband retrieved a naturalization record for someone last year. By Mail: NARA’s website says that naturalization records must be obtained by written request and that it can be done in person or by mail, fax, email, or online. I tried the online ordering link earlier today (4 Jan 2011) and it wasn’t working so I couldn’t learn more about how that process works. The fees page on their website suggests that there’s a charge of $.75 each for record copies and that there’s a minimum $15 fee for mail orders. 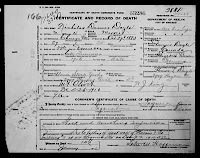 From FHL Film: The District Court naturalization records are available on Family History Library microfilm. 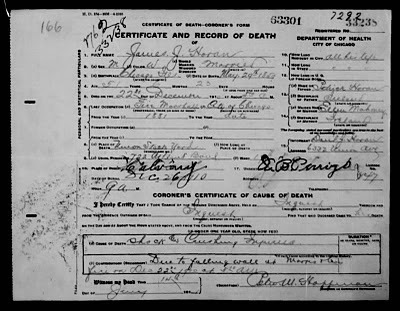 If you have access to a Family History Center you can order in the reels and obtain the records that way. Here’s a quick link to the film numbers up through 1947. 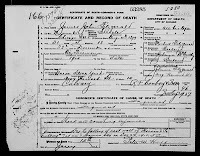 From a FHL Researcher: If you don’t have access to a Family History Center or if you’d like quick access to digital copies of the naturalization records, jorgfe offers that lookup on our Genlighten.com website. This post has grown much long and taken much longer than I expected to write and so I'll wrap things up with a couple of links to not-to-be-missed pages. Stockyards Fire Anniversary: Who Died in the Fire 100 Years Ago? An article by Becky Schlikerman on the Chicago Tribune website--100 years since Stockyards fire raged--caught my eye this morning and turned my attention to a fire that happened in the city's stock yards one hundred years ago tomorrow. The fire marshal, James Horan, was killed in the blaze and his descendants will commemorate the anniversary of the tragedy with a wreath ceremony. 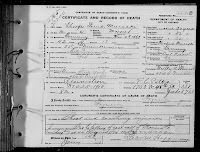 Mr. Horan's death certificate is available at FamilySearch and we can learn a lot about him from that record. 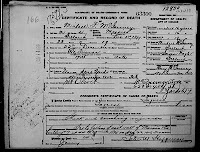 He was born in Chicago in 1859, the son of Irish immigrants, and he had served the city as a fireman just short of thirty years at the time of his death. Notice how the names of the cemetery and undertaker are written. 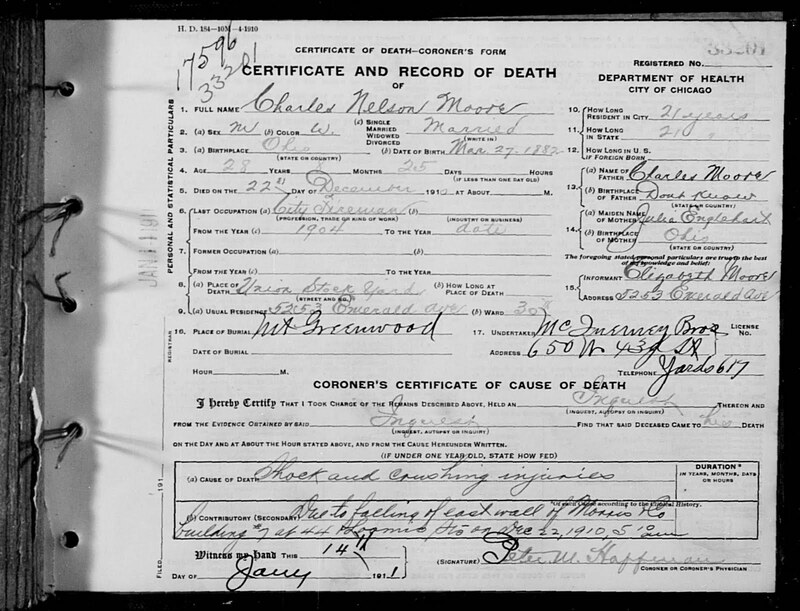 Is it possible that the family had a difficult time deciding where Mr. Horan would be buried? Or perhaps someone mistakenly wrote the wrong information and then corrected it? The informant, Daniel Horan, was Mr. Horan's brother and I can imagine him stepping in to help the grieving widow. Today's article says that the fire "left behind 19 widows and 35 orphaned children" and I wondered who those unnamed people were. I searched the Chicago Tribune at Footnote.com and found several articles mentioning funerals for the men who were killed. Twenty-four people died as a result of the fire, twenty-three on December 22 and one on December 23. Twenty-one of them, members of the Chicago Fire Department, are memorialized on a monument at the Chicago Union Stockyards. Of the remaining three, two were "firemen" employed by Morris & Co.--Andrew Dymuran and Patrick Realph--and one was a messenger boy, Stephen Leen. The Illinois Statewide Death Index entries for those who died in the fire are listed below. 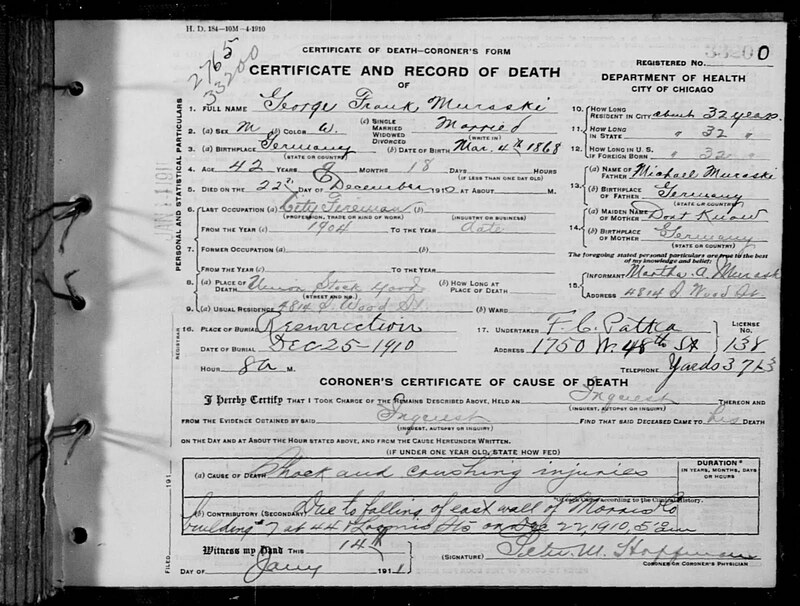 Click on the small images next to the death index entries to view the death certificates. 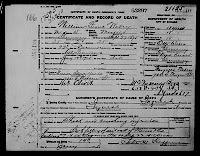 (I located the records on FamilySearch using a database called Illinois, Cook County Deaths, 1878-1922). 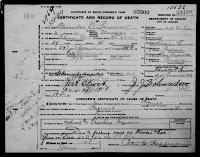 I haven't looked at these records carefully yet but it seems to me that each death certificate linked above will tell a story worth remembering--just like Mr. Horan's does. 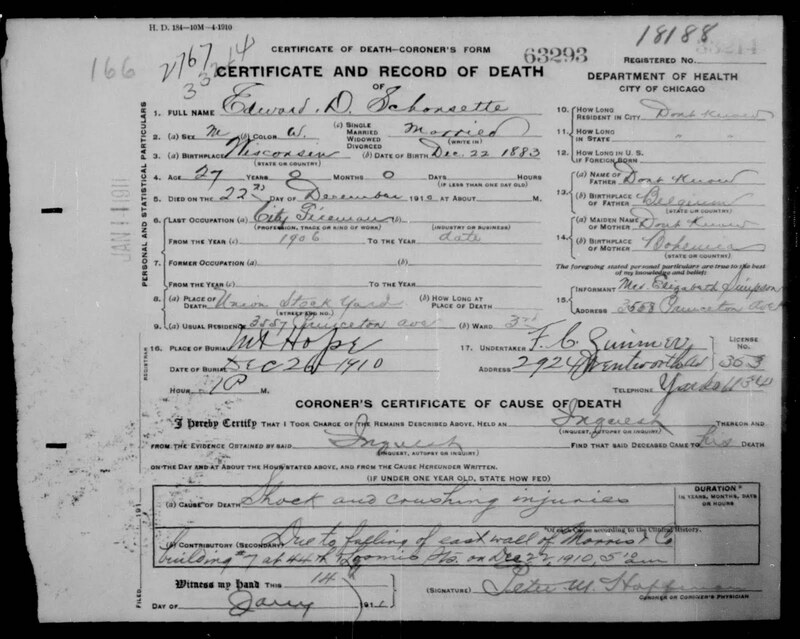 It's quiet at the Wilmette Family History Center today and so I decided to explore the Chicago entries in the Family History Library catalog as a way of learning more about the new FamilySearch website. 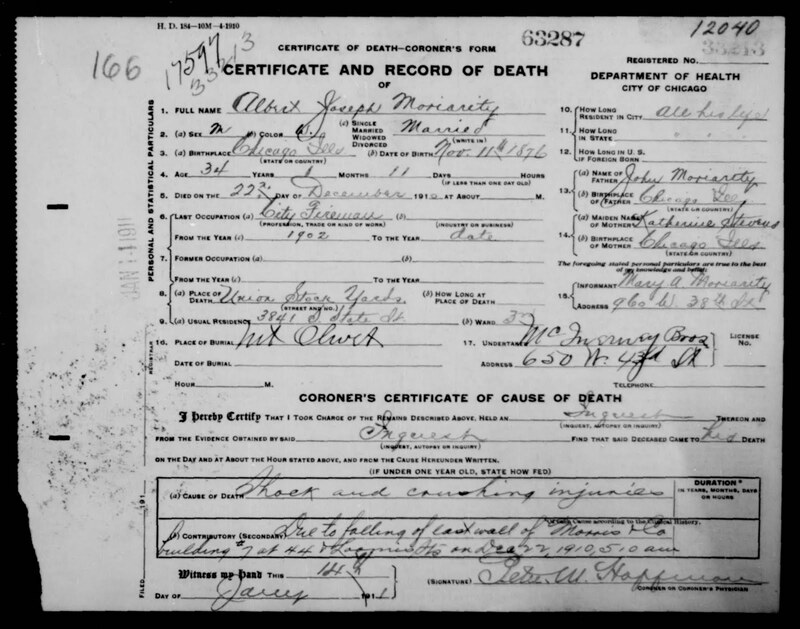 One of the titles that caught my eye was Marriage and death records, 1861-1905 from Chicago's Sinai Congregation, Film 1013426, Item 16. The reel was available and so I decided to take a look. The congregation's first service was held on 21 Jun 1861 and mention of it is made on the first page. The next page begins with January 1868 marriages and the entries seem to be numbered sequentially beginning with #91 and ending with #528. Following those entries there's a page that begins with marriage #1 from July 1861 (see the image) and the numbers then climb to #90. This means that there are approximately 150 pre-Fire marriages recorded in the book. It's a treasure of value to all of us but especially to those who have ancestors' names recorded there. The register entries include the names of the bride and groom, the marriage date, and the marriage date according to the Jewish calendar. A few entries have additional information. For example, one mentions that the bride was from Valparaiso, Indiana and at least two others note that one of the parties was born Christian. Some previous civil marriages are also mentioned. 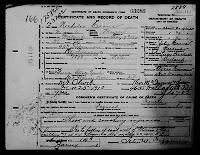 The death entries seem few and hard to find but the one I saw provided the name of the deceased and a death date. 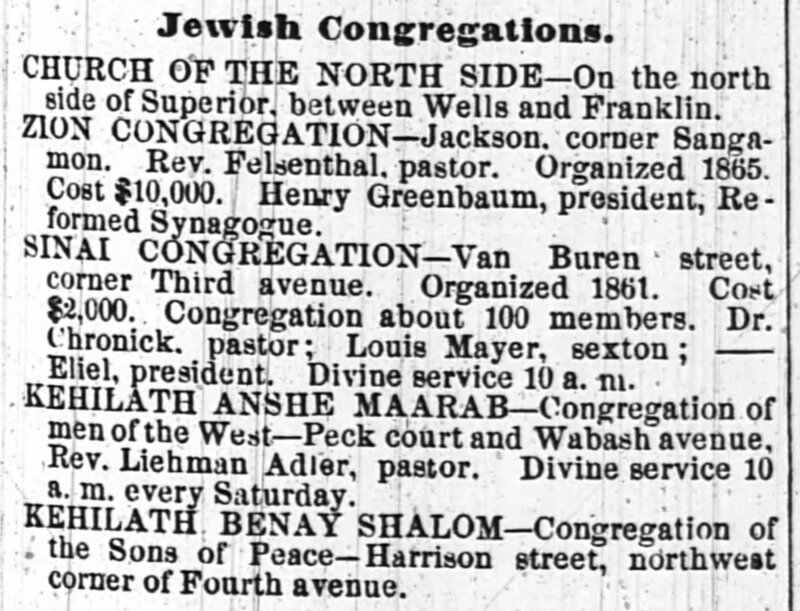 After looking through the book, I wanted to know a little bit more about the congregation and so I checked the 1870 Edward's Chicago City Directory (p. 931). 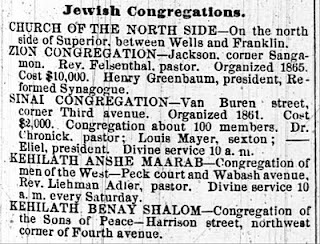 At that time the Sinai Congregation was listed at "Van Buren street, corner Third avenue," one of five Jewish congregations in the city, and it had about 100 members. The Chicago Sinai Congregation will celebrate its 150th anniversary in 2011. For more information about the congregation's history, visit their website. The film says the original marriage and death book is held by the Jewish Archives in Cincinnati, Ohio. A blog reader noticed an entry in the Chicago Daily Law Bulletin image I included in a previous post that referred to "People ex rel v Superior of House of the Good Shepherd" and wondered about the details of the case. I decided to follow up and obtained a copy of the file. 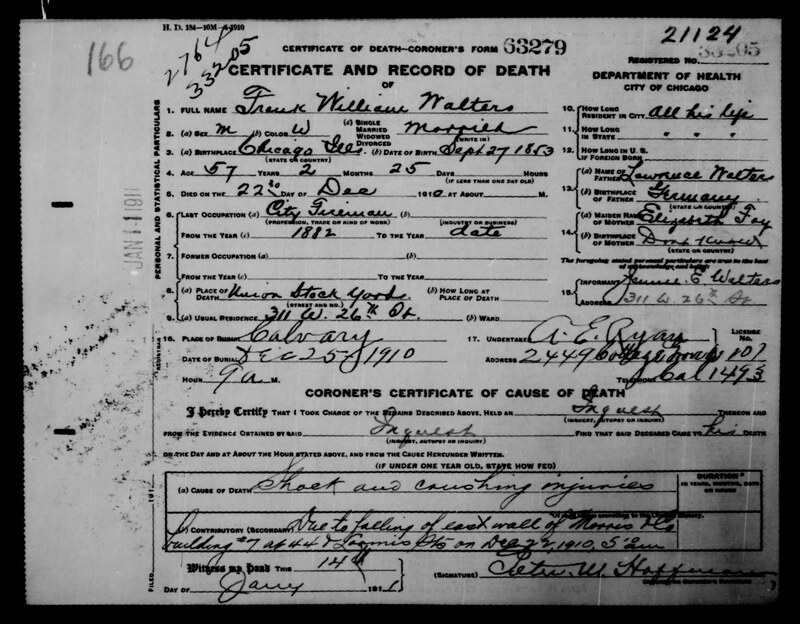 It seems a writ of habeas corpus was filed by a man named Miles Martin on behalf of a child named Sylvia Lear who was living at House of the Good Shepherd as Minnie Bell Pursell. 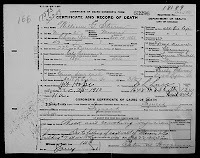 According to the document, "Sylvia was some years ago stolen from her mother and the parties who took her have since died and the child falling into other hands, at last was placed in said House of the Good Shepherd to avoid the care and Expense of providing for such child." The petition continued: "...the mother of said Sylvia after diligent Search and Enquiry for her child she having the only lawful right and custody to the care Custody and Education of said child, at last found out, that her said daughter was confined in said House of the Good Shepherd and that she demanded her said child of the Mother Superior of said Institution and was refused as well that she might see [her?] child at all." The judge wrote "Let the writ of habeas corpus issue pursuant to prayer of within petition." 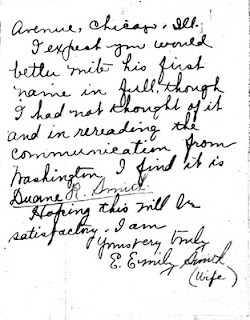 It was dated Jan. 3, 1880 but the year was actually 1881. Reading through the document, I wondered about Sylvia. Who was she? What happened to her? 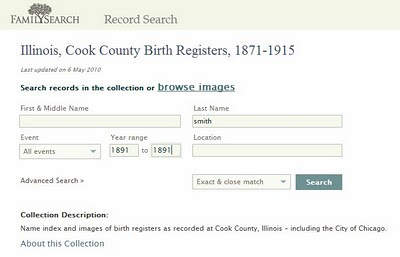 I checked the Chicago Birth Registers, 1871-1915 at FamilySearch's Record Search thinking she might have been born in Chicago but no good match turned up. 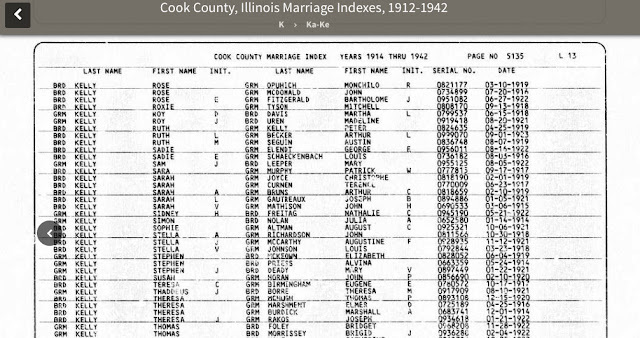 Then I checked the Cook County marriage index to 1920 thinking she might have stayed in Chicago and married, but no luck. 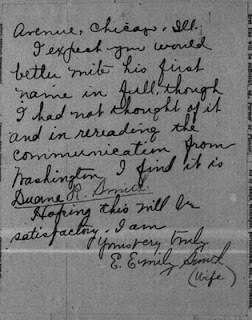 Then, I tried a search for "sylvia lear" in the Chicago Tribune at Footnote.com and found one match from 5 January 1881. 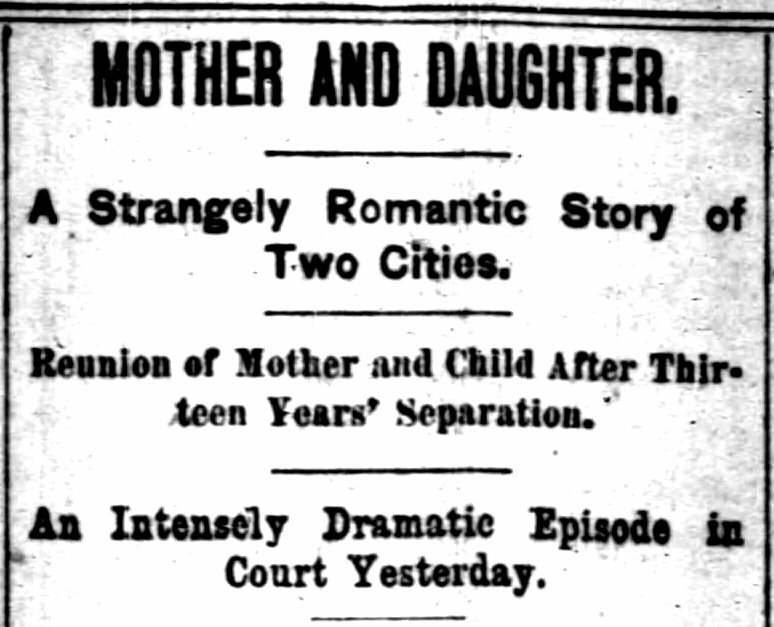 I thought it would be a quick mention of the case in a legal column but the headline read "Mother and Daughter. 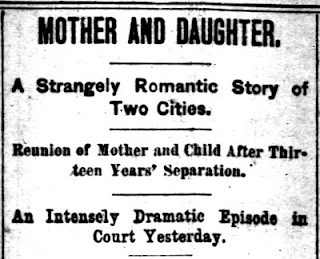 A Strangely Romantic Story of Two Cities. Reunion of Mother and Child after Thirteen Years' Separation. An Intensely Dramatic Episode in Court Yesterday." Sylvia's mother's name isn't mentioned beyond "Carrie" and "Mrs. W" in order to protect her privacy and, for the moment anyway, I think I will respect that. Still, I wonder what became of Sylvia Lear? 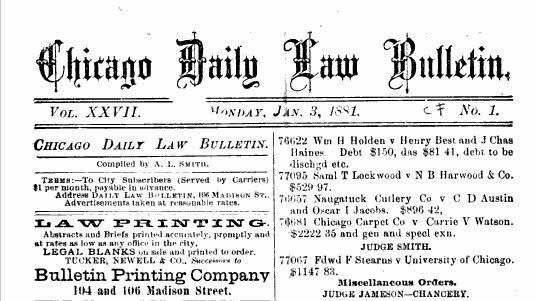 In a previous post, I mentioned finding the entry above in an 1881 Chicago Daily Law Bulletin and I promised to follow up. I asked the Circuit Court Archives to have the file brought in from the warehouse and I returned to view it last Friday. The file held no surprises. 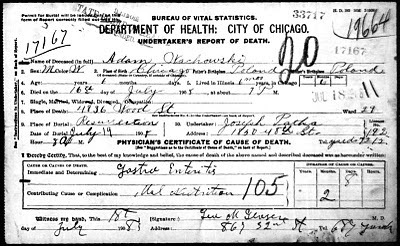 Mr. Schwahn naturalized in 1865 and all record of his naturalization was destroyed in the Chicago fire in 1871. He petitioned the court to have the record restored and it was. So, what do we learn from the documents? First, that Mr. Schwahn was very likely naturalized, as stated, on or about 1 November 1865. Second, that he had "resided within the limits and under the jurisdiction of the United States for and during the full term of five years last preceding said 1st day of November" and "more than one year immediately preceding the said date in the State of Illinois." We also learn that he renounced allegiance to "the Emperor of Germany whereof he was heretofore a subject." 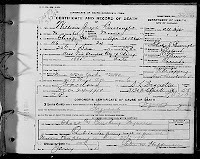 In other words, we learn that he was from Germany and that he arrived in the United States 1860 or earlier. We also learn that nearly twenty years after he was naturalized he had reason or desire to have note of it restored to the Court records. In some cases, this information might provide valuable clues to follow up on. A typescript of the document is given below. That on or about the first day of November AD 1865 said petitioner appeared in this Court and showed to the Court that he had resided within the limits and under the jurisdiction of the United States for and during the full term of five years last preceding said 1st day of November and more than one year immediately preceding the said date in the State of Illinois, and that during said term of five years, he had sustained a good moral character, and appeared to be attached to the principles contained in the Constitution of the United States and well disposed to the good order, well being and happiness of the same, and that two years and upwards had elapsed since said petitioner filed the declaration of his intention to become a citizen of the United States, according to the provisions of the several acts of Congress heretofore passed on that subject. That thereupon said petitioner in open Court took and subscribed he oath required by the laws of the United States, to support the constitution of the United States and to renounce and abjure all allegiance and fidelity to every foreign Prince, Potentate, State or Sovereignty whatever, and more particularly all allegiance which he in any wise owed to the Emperor of Germany whereof he was heretofore a subject. That thereupon an order was entered by this Court finding all the foregoing facts, and ordering that the said petitioner be, and he was thereby admitted to all and singular the rights, privileges and immunities of a naturalized citizen of the United States, and that it be certified to him accordingly. That thereupon a certificate of such naturalization was issued to said petitioner out of this Court under the seal thereof and signed by the Clerk of this Court. 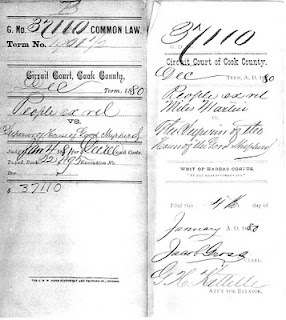 That afterwards and on the 9th day of October 1871 the records of this Court including the record of the said order, and also the said certificate of naturalization issued to said petitioner were totally destroyed by fire without the fault or neglect of said petitioner and that said defect cannot be supplied by any certified copy of said order or certificate, and the loss or destruction thereof, unless supplied, may result in loss or damage to this petitioner. And the Court being now fully advised in the premises, it is ordered adjudged and decreed by the Court that the substance of the said order of naturalization as herein above set forth, be and the same in hereby restored of record. There's something you should know about me before you read this post. If I had all the time and money in the world, I would sit around all day alternating between two things: genealogical research and playing my fiddle. Well, maybe three things. I'd probably need a bit of chocolate to keep me going. I like history. Chicago history. And I like music. And when something captures those things together, it catches my eye. A few weeks ago I learned that there will be a benefit concert at the Old Town School of Folk Music on Sunday, October 3, to raise money to purchase gravestones for the McCoy brothers, Chicago musicians who died in 1950 and were buried in unmarked graves. I thought I'd help get the word out. There will also be guitar, mandolin, and body percussion workshops and a walking tour of the Restvale Cemetery that day. I don't know much about the McCoy brothers--only what I read at the tribute website--but I like them. I like that music was their passion. And I like that there are people who value their music and want them to be remembered. If you can't make the concert, consider donating a few dollars to a good cause. A couple of weeks ago I was searching microfilm indexes at the Circuit Court Archives looking for a divorce entry and I came on some pages that I found close to impossible to read. The writing was small and faded and I had to give up. Unfortunately, I didn't find the divorce in any of the other years I looked at and so the search is hanging. And soon after, I met a Family History Center patron who has been unable to find a naturalization petition for his grandfather. It's possible the process was never completed but the researcher isn't ready to give up. In both cases I wondered if there might be an alternate way to search for court records, and the Chicago Daily Law Bulletin came to mind as a possibility. 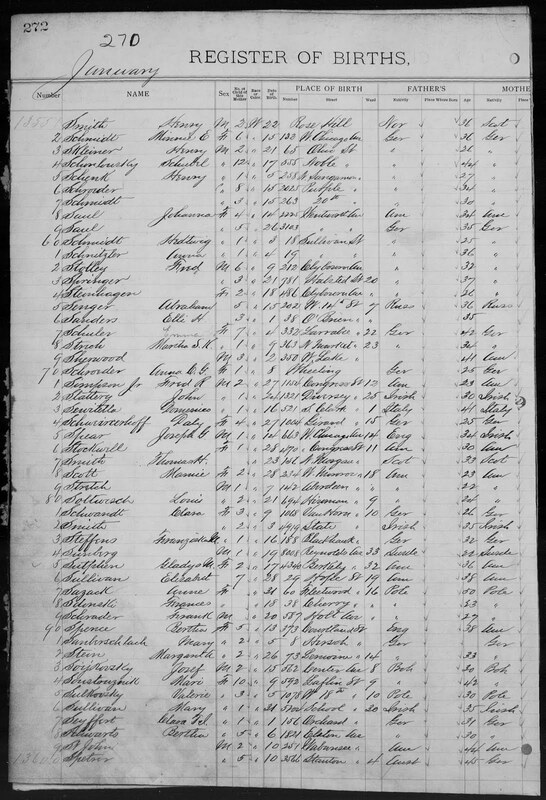 I learned, some time ago, that it's a good way to search for adoptions (see this post and I wondered if it might be a good tool to use to search for divorces and naturalization records, too. I was able to find one copy of the Bulletin online at Google Books. It's from 1881. I haven't looked at earlier or later volumes and so I don't know if this one is representative of all of the volumes or just those published in the 1880s, but I'm guessing the information is similar. The District Court is also mentioned later in the volume. And there are specific mentions of bankruptcy, chattel mortgages (deferred payments on furniture and musical instruments), bills of sale, and trust deeds, mortgages, general assignments. I even stumbled on an adoption in the County Court. 37111 Linns B Bentley v Lucy Bentley. Bill for divorce. H F Vallette solr. 36995 Meiter v Meiter. Ord for deft to pay $50 solrs fees and $8 per mo alimony. I believe the number in front of the entry could be used to order the file in from the warehouse at the Circuit Court Archives. Unfortunately, it's hard to tell if naturalizations were routinely listed. I searched using variations of "petition" and "naturalization" and came up empty handed except for five entries to restore records. I'm curious to know what these cases were about and I will try ordering in a file the next time I go downtown. 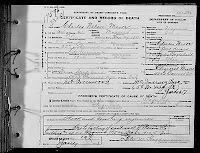 I'll also try to find an index entry for an 1881 naturalization so that I can see if mention of it appears. 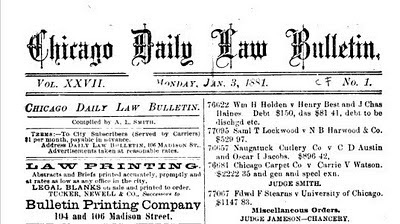 Watch for "Exploring the Chicago Daily Law Bulletin, Part II." And in the meantime, if you have a few minutes, you might want to explore the Bulletin on your own. If you find something interesting, please post a comment. FamilySearch's Record Search continues to grow and yesterday (August 13) a new series was added. 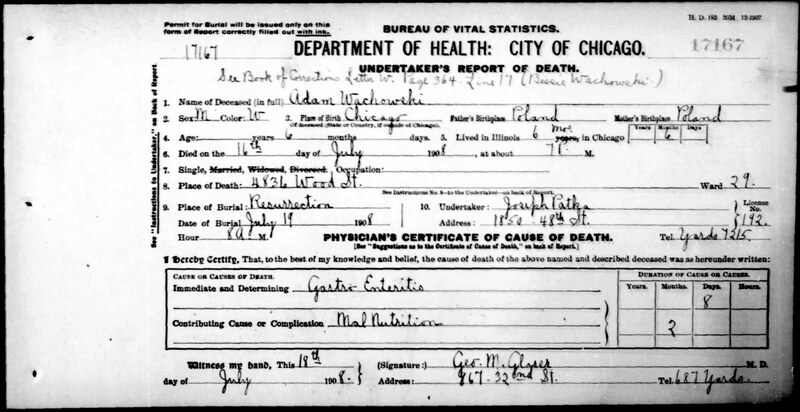 The title is Illinois, Deaths and Stillbirths, 1916-1947 and the description reads "Name index of deaths and stillbirths in Illinois, 1916-1947. Includes records for Cook County and Chicago." 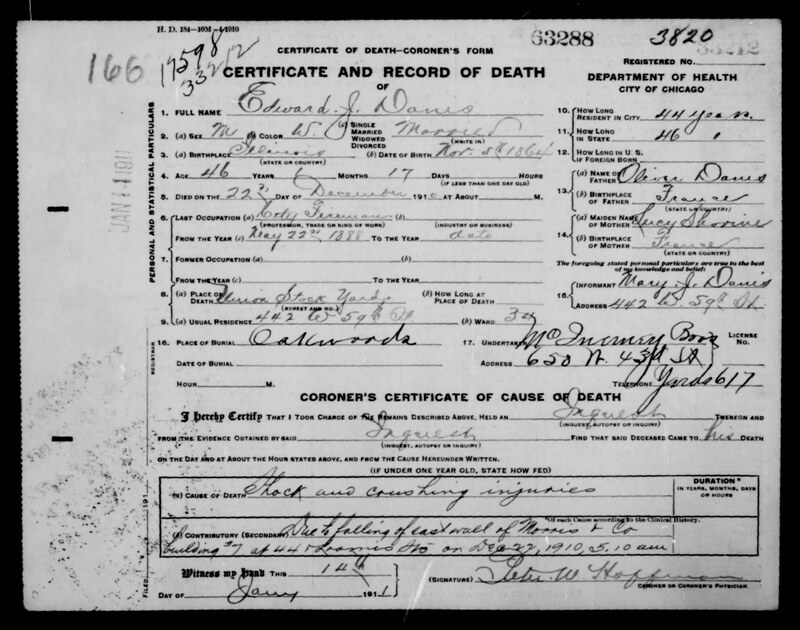 The corresponding images don't seem to be online but the index provides a wealth of information (if listed on the record) including birth date and place, parent names and birth places, spouse name, burial date and place, and occupation. You can also order the films through any Family History Center. The cost is $5.50 + any notification fee a center might add and the reels usually arrive in about 2-4 weeks depending how often a center orders and whether or not a film is on backorder. 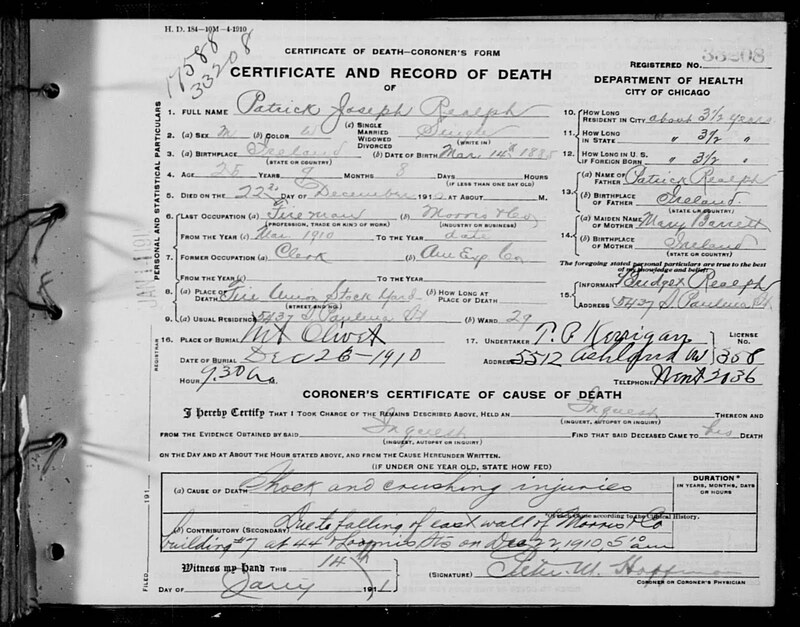 If you find a Chicago/Cook record, 1916-1922 listed in the statewide index, you should check FamilySearch's Illinois death certificates and stillbirths, including Chicago, 1946-1947 to see if the image is available there. 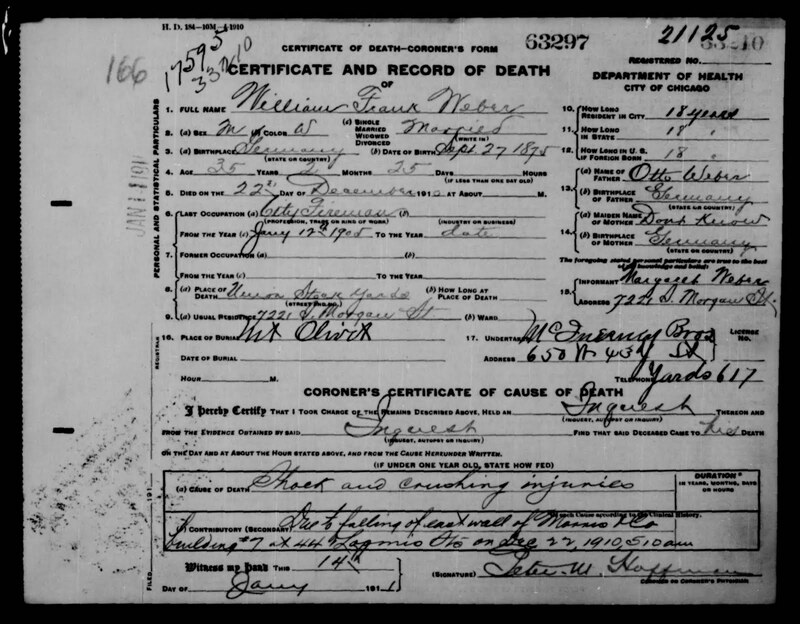 Between 1916 and 1922 there should be some overlap in the two databases. Note the subtle differences between two entries for the same death. Street Address: 346 N. Lockwood Ave. 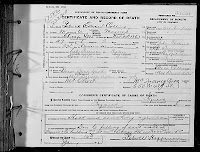 Recently, I wanted to find a family in the 1900 census. I was told that they lived at 708 Melrose from 1896-1903 and so, theoretically, they should have been enumerated at that address. (I double-checked the 1896 and 1901 city directories and that was the address given.) 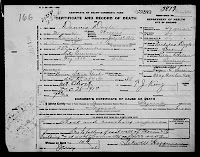 Unfortunately, a name search of the 1900 census yielded no match. It's possible to the maps at A Look at Cook to determine the enumeration district in order to page through a census, but it's also possible to use a neighbors approach now that the Chicago city directories are online and searchable at Footnote.com. In this case, I searched the 1901 directory by address (708 Melrose, 706 Melrose, etc.) 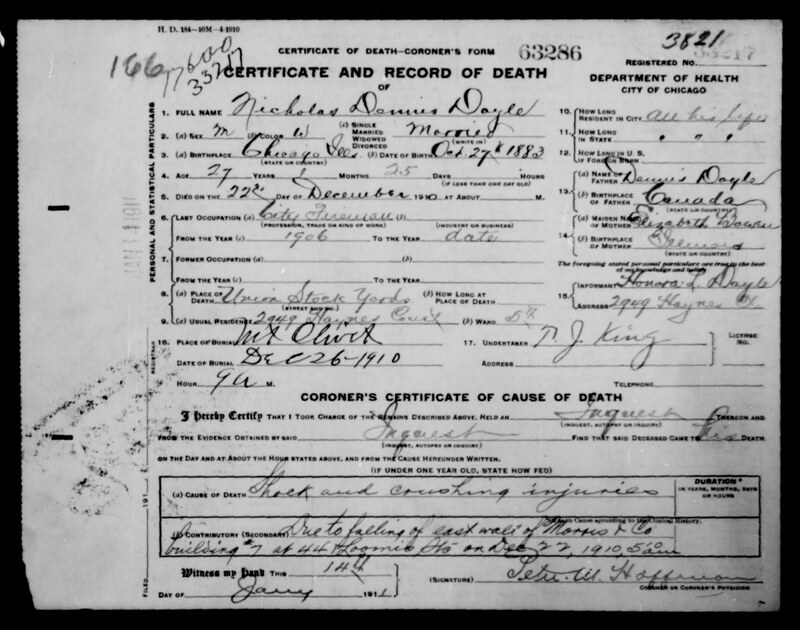 looking for a name that I thought would easily appear in the census index at Ancestry.com. (Note: It's important to put the search terms in quotes, e.g., "704 Melrose") Carl Schmidt at 706 Melrose was a possibility but the name was too common. Eventually, I found Richard E. Pause at 702 Melrose and I was able to easily locate him in the census. Scrolling down the page, the entries jumped from 704 to 710 making it appear that 706 and 708 were skipped. I followed a similar approach to locate the odd numbers for the same street thinking that perhaps the entries were made out of order. This page shows 707, 709, and 711. I'm thinking it's possible that the families living at 708 Melrose were, indeed, skipped, but why? I notice in the 1900 city directory that there's a business listing for Bruno Rohden (stove repairs) at 708 Melrose. Is it possible that 708 Melrose was a storefront and that the enumerator didn't check to see if anyone was residing at that address? 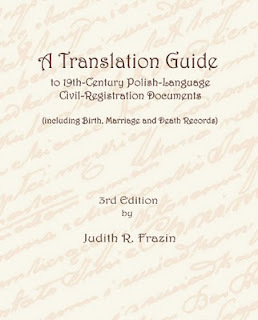 (including Birth, Marriage and Death Records) and the newest edition of the book recently won her an achievement award from the International Association of Jewish Genealogical Societies. 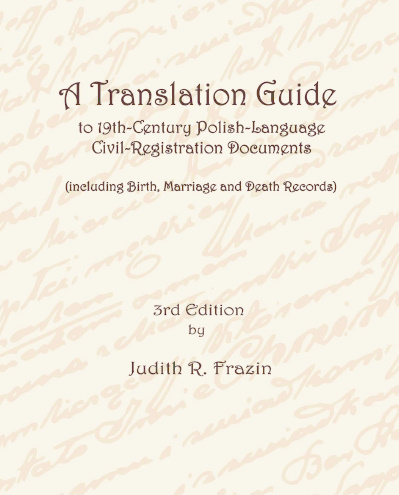 If you are researching Polish ancestors, as many people who have Chicago roots are, take some time to explore this book! Check WorldCat to see if there's a copy available at a library near you. (The Wilmette FHC has one, if you're in the area.) If not, you can order it through the Jewish Genealogical Society of Illinois website. This is one of those not-sure-what-it's-worth-but-it's-fun-to-ponder posts. 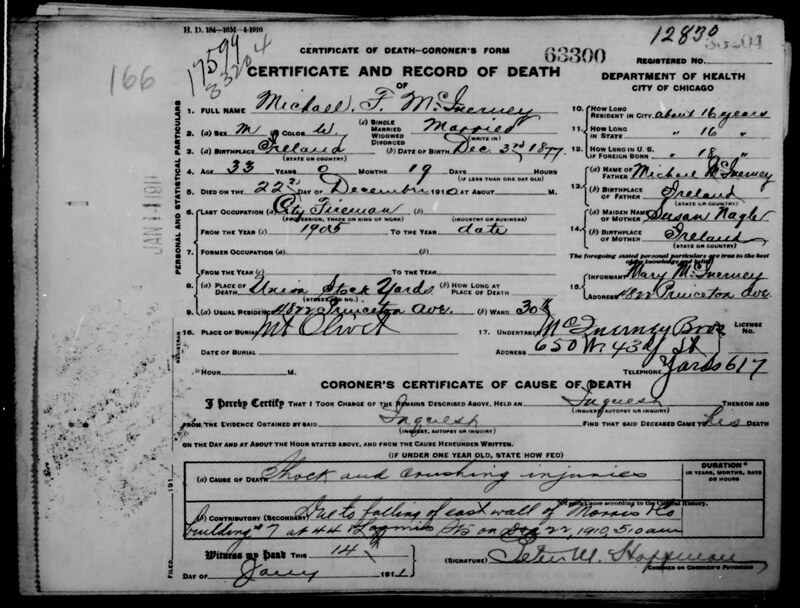 I was searching for a death record online at FamilySearch.org's Record Search and I happened on two death records for the same individual. I wasn't surprised. I knew that from 1908-1915 there are two sets of records for Chicago--but I had never really compared certificates from both sets before. 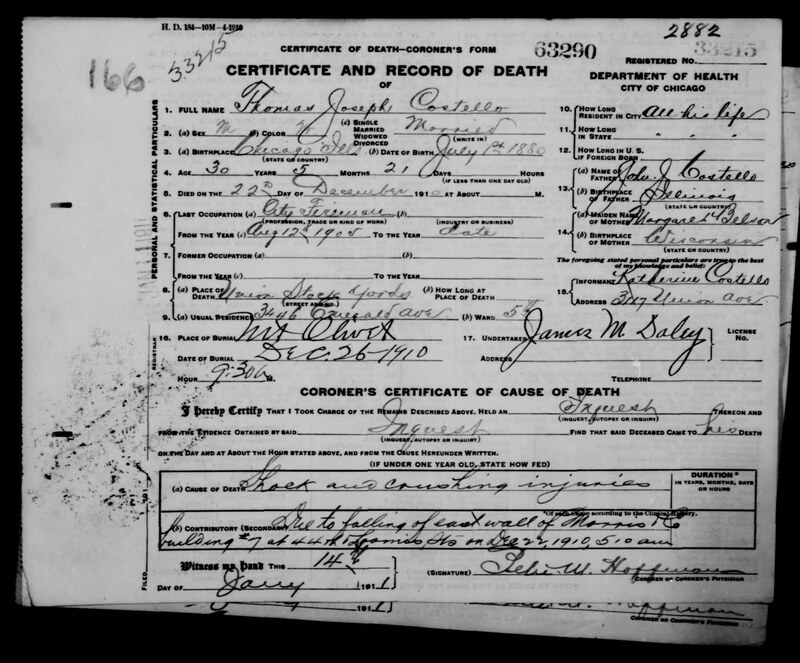 I believe the first record, the one with hurried handwriting stamped with numbers and a date, is the original, and the handwritten number in the top right corner is the certificate number--the one you find in the online index--and that's how those records are arranged. I think the second record is a copy of the original probably made at the Cook County Clerk's Office. Notice that it has a different number in the top right corner--a register number--and that's the way those certificates are organized. Things to notice . . . The original certificate has the register number written on it in two places. The two records are connected. The information on both records seems to be exactly the same. The original record seems to have been torn from a book of records. The duplicate seems to be part of a book. Things to wonder . . .
What does the number "33717" on the original certificate mean? What does "See Book of Corrections Letter W Page 364 Line 17 (Bessie Wachowski)" mean? On later records I've seen certificates of correction. What is it about this record that's wrong? Or do these records reflect a correction? Is information from the Book of Corrections available from the county clerk's office? 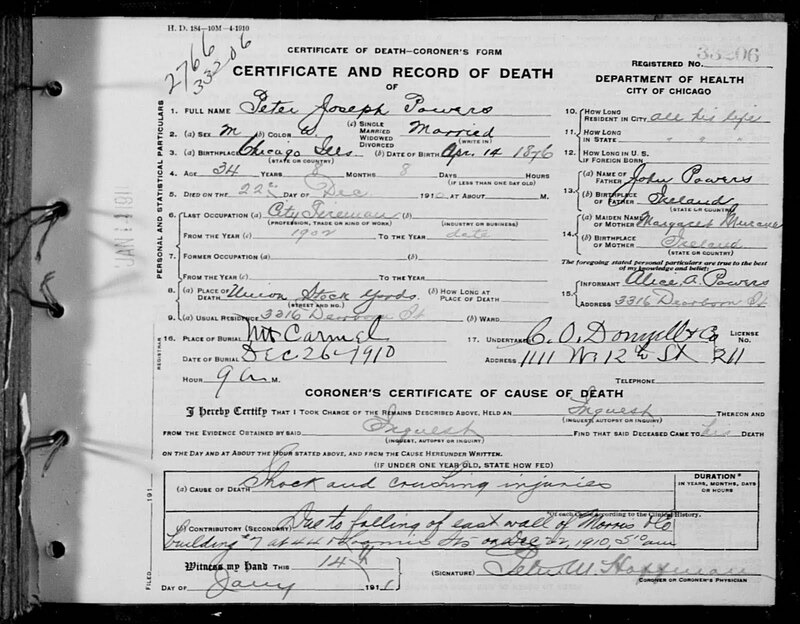 The cause of death has the number "105" written next to it. Was that a code for "gastroenteritis" and/or "malnutrition?" I think the answer to that is yes--gastroenteritis. 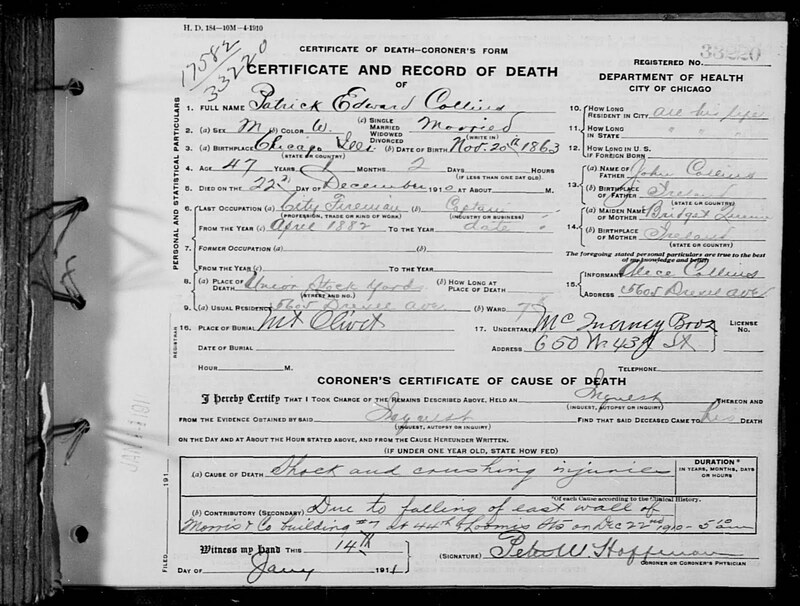 Take a look at a record with the same cause of death and same code. 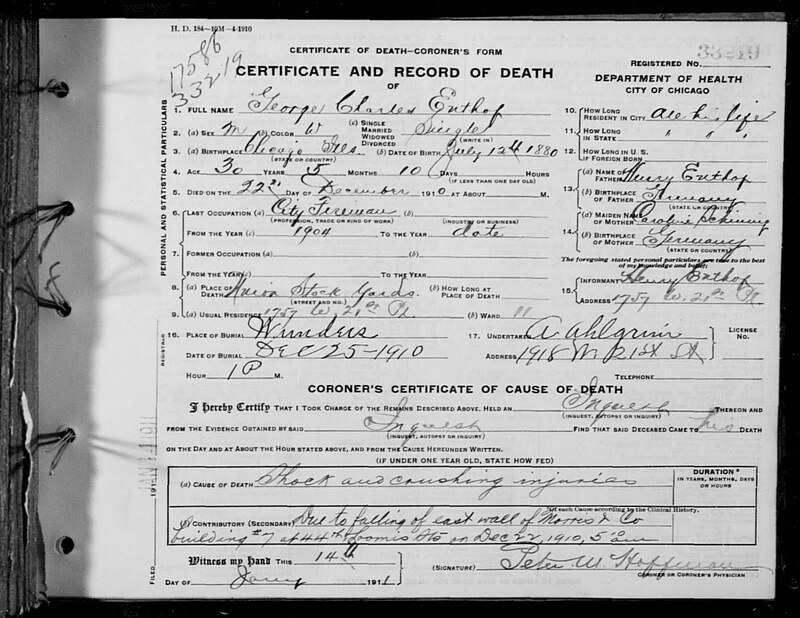 And notice that the cause of death code doesn't appear on the copied record. Who put that code on? Who kept track of that information? What was done with it? 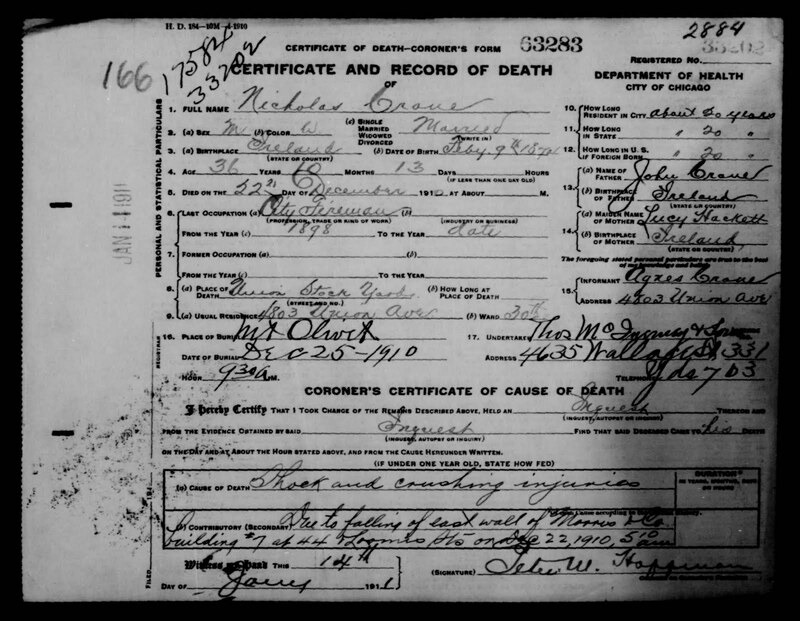 What discoveries have you made about the death records at FamilySearch's Record Search? Feel free to post a comment and share. Fourth of July and I was looking for something to play on the fiddle to celebrate the occasion when I remembered that my husband's ancestor, Benjamin Swetland, a Revolutionary War fife major, had jotted down a couple of tunes in a notebook which was handed down through a number of generations and then, apparently, donated to the Chicago Historical Society. A facsimile of the notebook page appears in Chapter Sketches By Connecticut Daughters of the American Revolution (see Google Books). 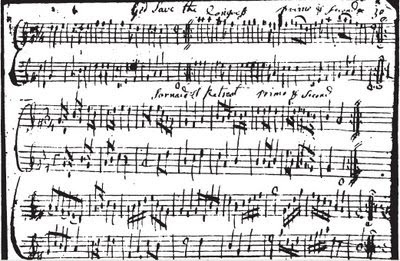 The first tune "God Save the Congress" is the tune that we know as "My Country 'Tis of Thee." But I can't read the title of the second one and I don't recognize the tune when I try to play it. Can anyone help? Can you read the title? Do you know the tune? 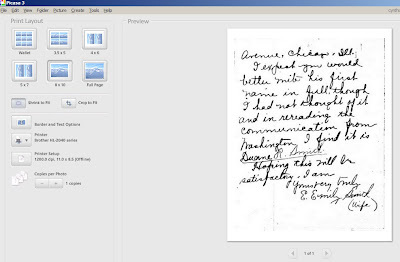 I'm a fan of Picasa, a photo editing program that's available for free download from Google, and I mostly use it for organizing, tweaking, and sharing scans of genealogical documents. 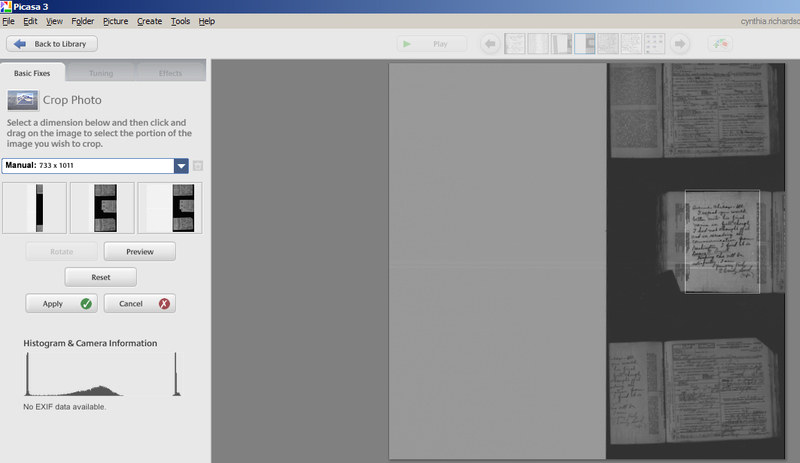 A Picasa tutorial is beyond the scope of a short blog post, but I thought it would be useful for me share a list of the features I find particularly helpful with some simple directions on how to use them. 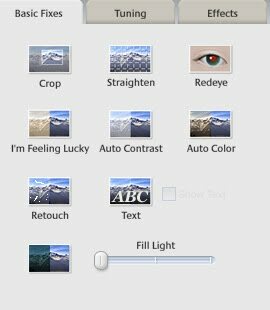 Select Images to Appear: You can decide which images appear in Picasa by selecting folders under "Tools" then "Folder Manager." Organize Images: Move images from folder to folder by dragging and dropping. 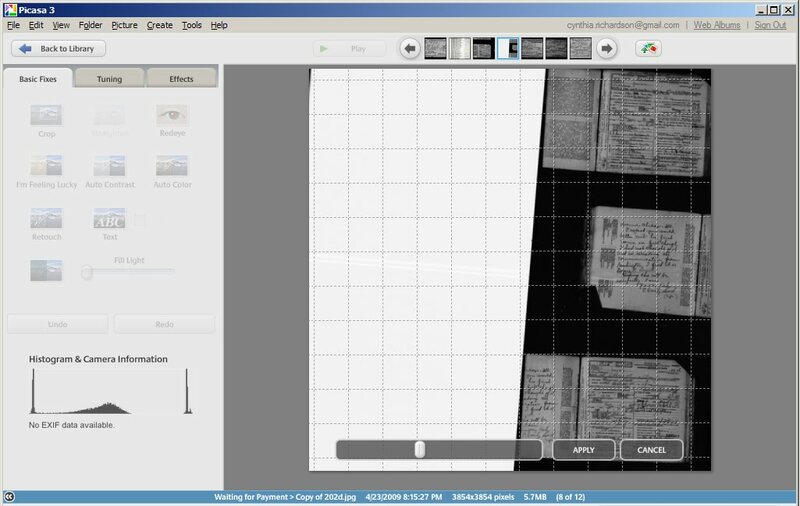 You can also rearrange images within a folder using the same approach. Rename an Image: Click on an image to select it, then hit F2. Type the new image name in the pop-up box. Rename Multiple Images: Select multiple images (holding down Ctrl lets you do that) and then hit F2. Type an image name and the selected images will be renamed in sequential order. For example, decree.jpg, decree1.jpg, decree2.jpg, etc. If you open Picasa and double-click on an image and you'll see three tabbed menus appear on the left: Basic Fixes, Tuning, and Effects. These menus are key. Rotate an Image: Click "Straighten" under the "Basic Fixes" tab; use the sliding bar to rotate the image left or right, then click on "Apply." 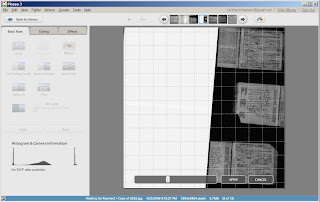 Crop an Image: Click "Crop" under the "Basic Fixes" tab; draw a box around the portion of the image you want to save and click "Apply" when done. If you're not happy with how the cropped image turned out, click "Recrop" and try again. Tweak Brightness and Contrast Automatically: Click "Auto Contrast" under the "Basic Fixes" tab; if you're not happy with the result, just click "Undo Auto Contrast." If Auto Contrast doesn't work, click on the "Tuning" tab. Move the sliding bars to tweak the image. Print an Image: Click on the image(s) you want to print. Click on the "Print" icon at the bottom of the page. Use the resulting menu options to assure that the image will appear on the page the way you want it to. Upload an Image to a Picasa Web Album: Web albums are a great way to keep, backup and share images. Click on the "Upload" button and follow the instructions. Images will be sent to a folder associated with your gmail address and once they're there you can rearrange them, add captions, and share links to individual images or a folder. It's a convenient way to back up the files and it's a nice way to make sure they're accessible from any place you have Internet access. These are just a few ideas but I'd encourage you to explore the program to discover other useful features and if you discover one, please add a comment to this post. 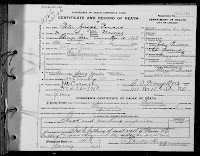 I recently received a request for help in finding a death certificate for William J. Quinn. It doesn't come up easily in search results at FamilySearch's Record Search even though it's there. I checked the Cook County Coroner's Inquest Index. 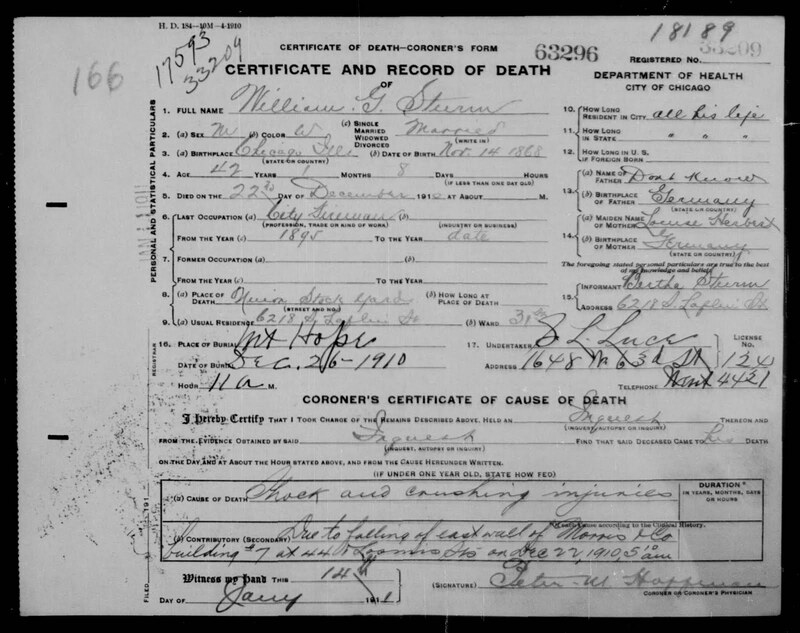 If the name was there, William would have had a coroner's death certificate (different from the inquest) and I don't think those records are online. Searching "Quinn" and scanning for the death date, I didn't find a match. 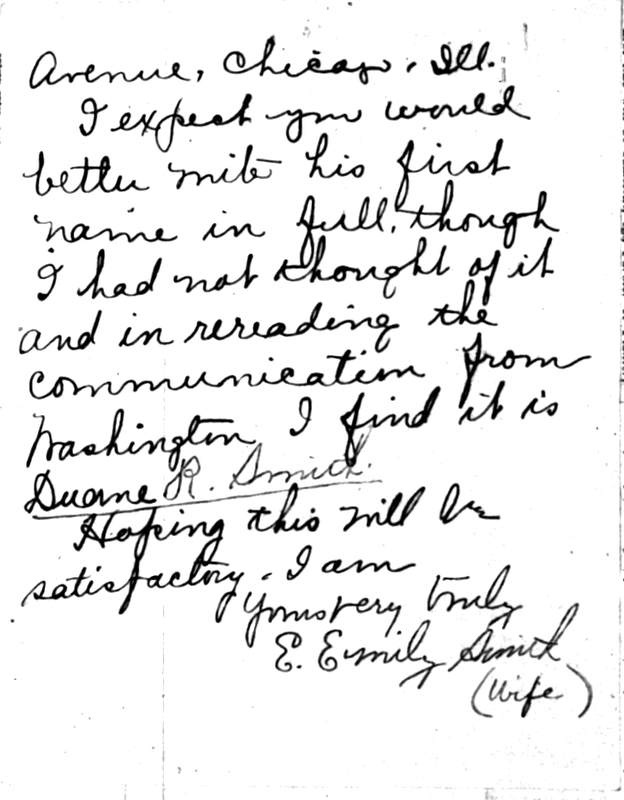 I found a number of possibilities and so I chose the one that I though had the best chance of being indexed correctly: Charles Quinlin. 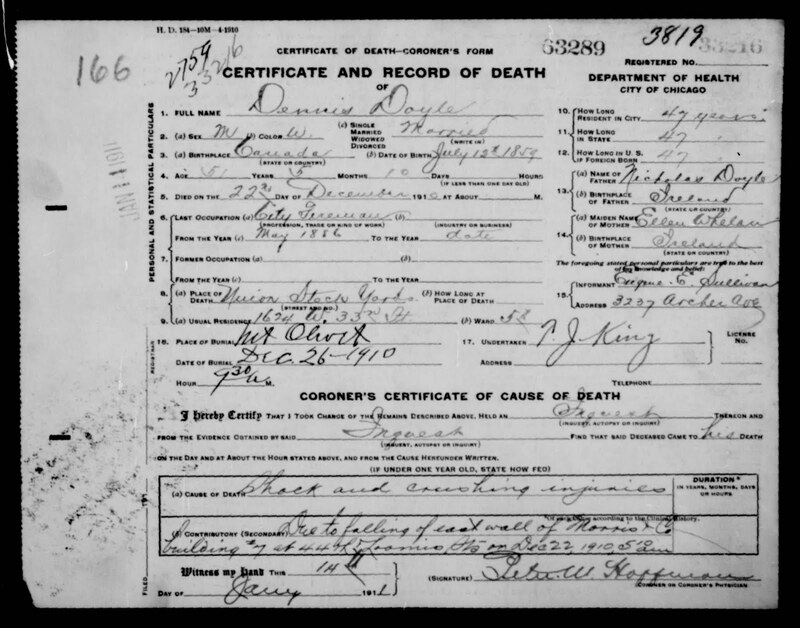 I searched Record Search for "Charles Quinlin" and narrowed the results to Cook County death certificates by clicking on the "Collection" link at the top of the page. 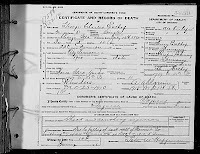 In this case, Charles' record came up easily and it happened to be one certificate away from the one I was looking for. I clicked to move one record forward and discovered that was #14951 and I was looking for #14953. 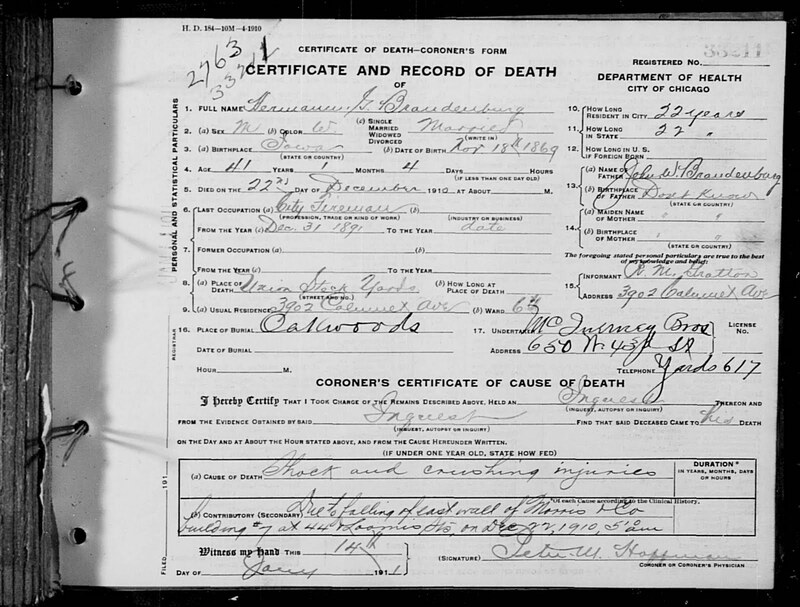 I moved one record the other direction and located the record for William J. Quinn. 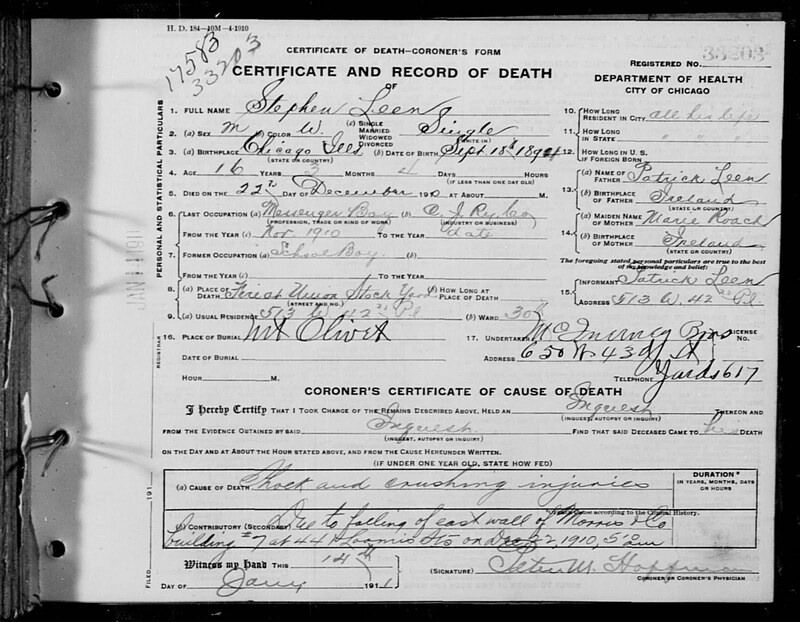 Looking at the record, I could see where an inexperienced indexer might read the surname as "Luinn" so I searched for that. No luck. So I tried Tuinn. No luck. So I searched William J. and found 151 close matches but no luck. So I tried Nilliam. And then I decided that it wasn't all that important for me to figure out how the record was indexed. My goal was to find the record and I did. 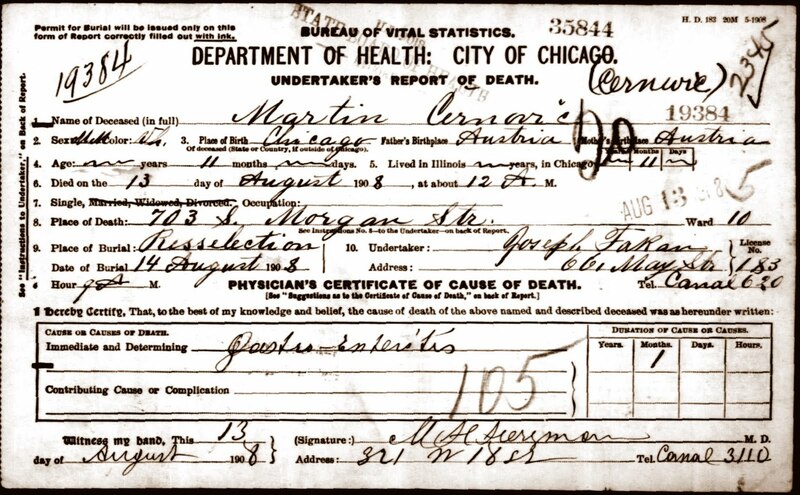 So, the short of it is this: if you don't find an early Chicago death record on Record Search, check the inquest index. 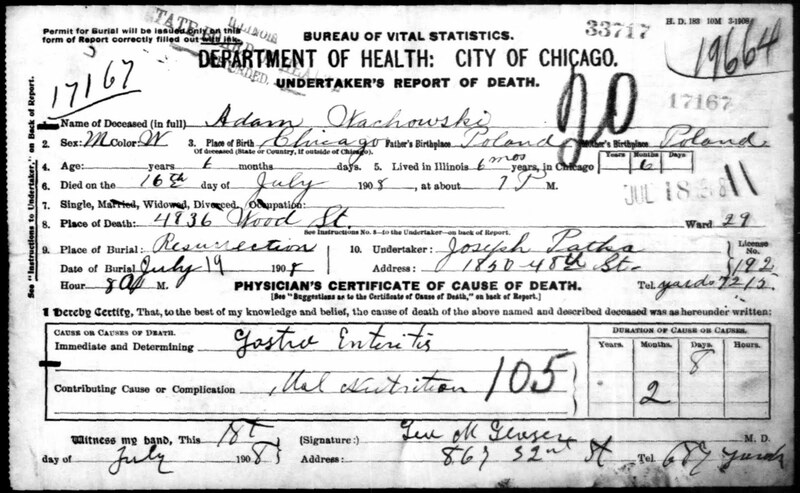 If the name isn't there, locate the index entry in the Illinois Statewide Death Index. Then use Stephen Morse's One Step to find certificates beginning with the same surname letter for the same month and year. Search for nearby certificates, then once you're in the database, page through looking for the correct number. 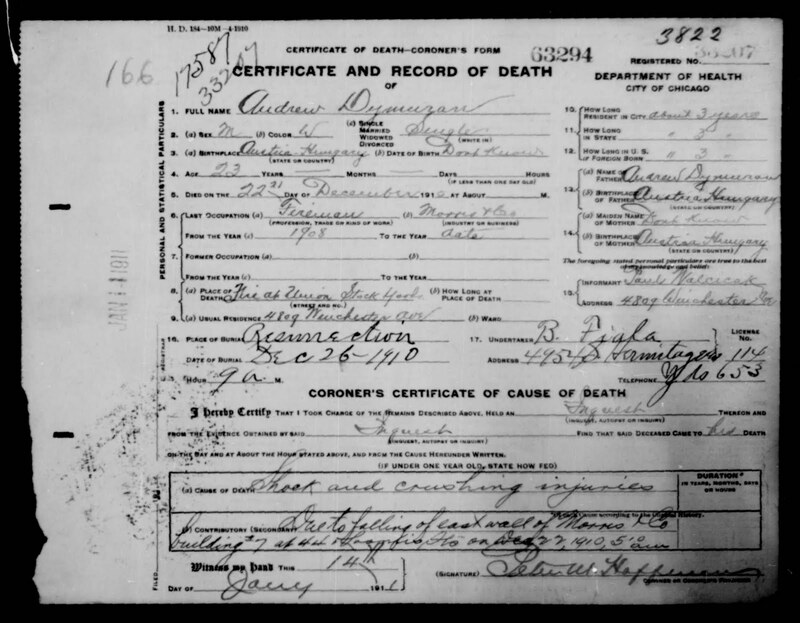 If the name is on the coroner's inquest index or if you find a gap in numbers where the certificate should be, you are welcome to email me for help. I’m going to stick my neck out here. 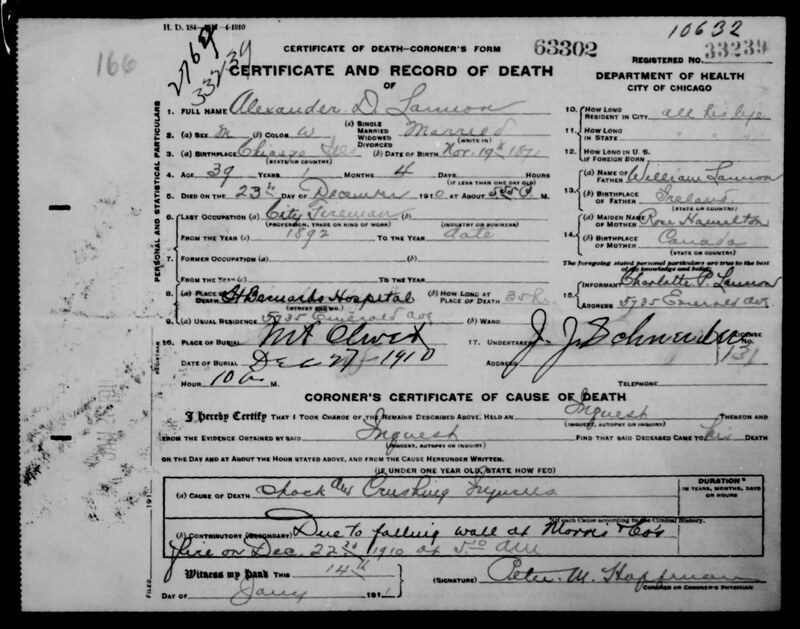 I suspect (but don’t know for certain) that the birth certificates available on FamilySearch now include all of the Chicago records that were available when the records were microfilmed. 1) The birth wasn’t reported so there’s no birth certificate to be found. 2) The name is misspelled in the index. 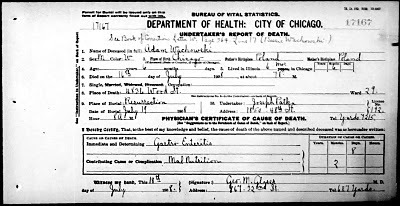 One of the best ways to check for both possibilities up through 1915 is to use the Chicago birth registers which are also online. A little bit of background. 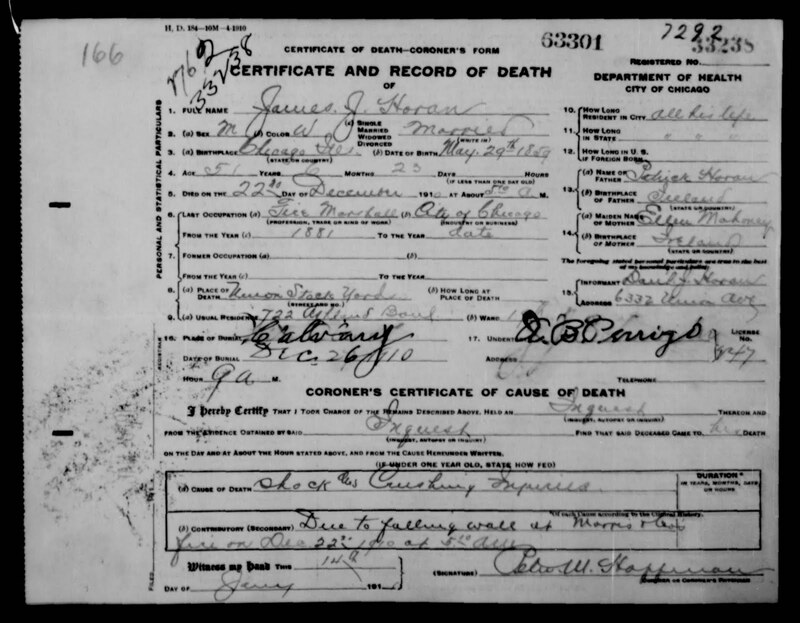 It seems reasonable to me that the birth registers were created to log birth certificates that were returned to the county. The entries in all but the earliest books group names together by the first letter of the surname for each month. 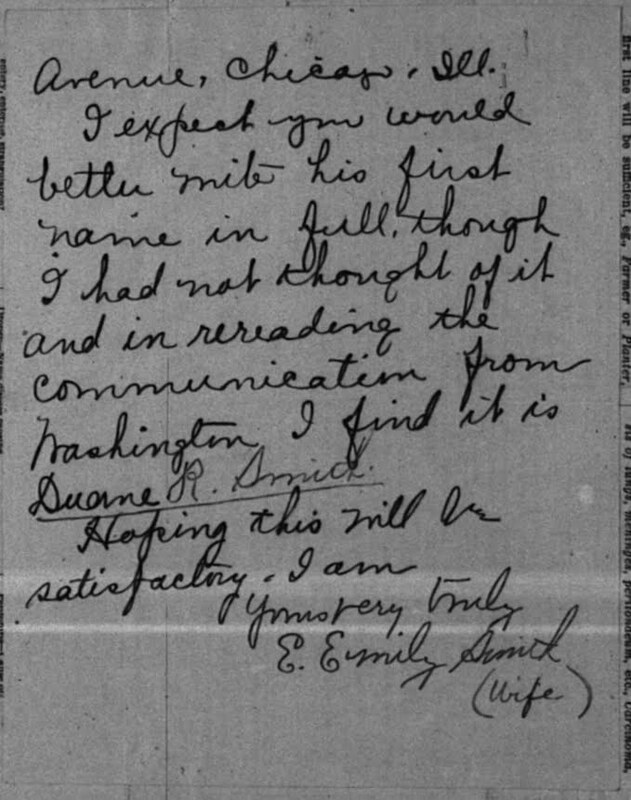 For example, all the “G” entries for April 1901 would be together, followed by all the “G” entries for May 1901, etc. The entries aren’t alphabetical. They’re in certificate number order which makes me think that the numbers were assigned as the records were recorded in the books. 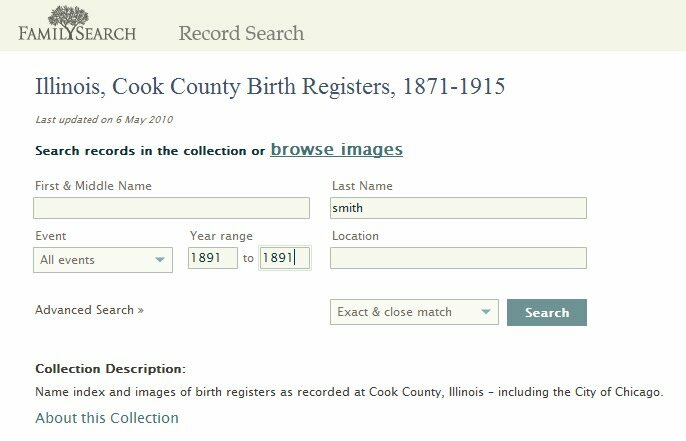 So, because of the arrangement, it’s possible to use the registers as an alternate index if you know the month and year of birth or if you have a good deal of patience . . . .
1) Navigate to the search page for “Illinois, Cook County Birth Registers, 1871-1915. 2) Type a common name with the same letter of the name you’re looking for in the surname box and type the year of birth in the year ranges boxes. In this case, I'm looking for an "S" birth, so I’ll use “Smith." For surnames beginning with other letters, you may have to try a few different names to be able to find a register in the ballpark of the month/year/name you're looking for. 3) Browse to find a birth from the same month you’re looking for. 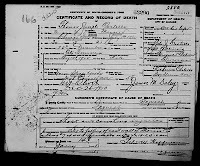 In this case, “Henry Smith” born January 1891 will work. 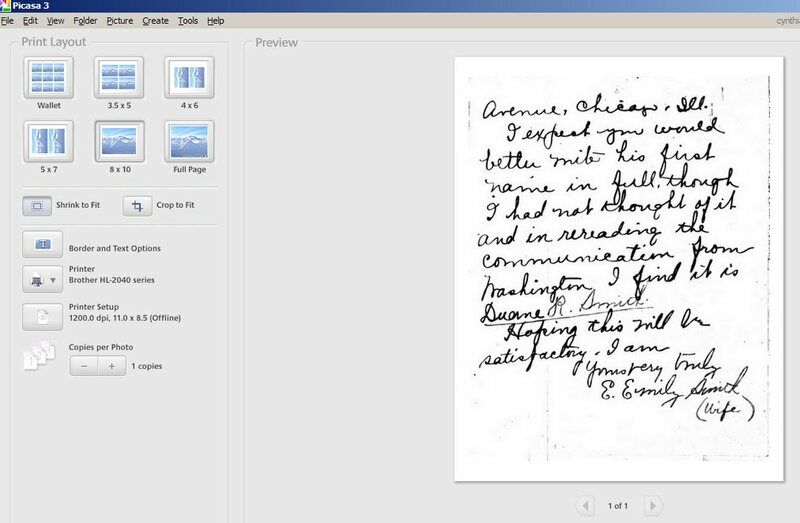 4) Click on the name, then click on the small thumbnail in the upper right-hand corner to view the register image. 5) Use the arrow buttons to navigate back to the beginning of the “S” section for January 1891. The month is usually on top of the left-hand page; the year is on top of the right-hand page. Each page has fifty entries and in my experience, even common letters of the alphabet have just a few pages to check. 6) View each register page looking for a match. 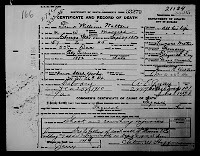 I often look at the surname, the birth date, the mother’s name, and/or the father’s name. 1) The catalog entries in the Family History Library Catalog can help you figure out the arrangement of the register entries. 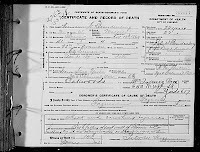 For example, in this case, the December 1890 “S” births came just before the January 1891 S” births. For some years, they might be in different books. 2) The register entries cross two pages. 3) For some of the later years, you might find stillbirths or infants who died soon after birth listed at the end of each section. 4) If you find a matching register entry, there should be a matching birth certificate and if you’re using film, you can use the register number to find the certificate. Most certificate numbers have five digits but you might see just two by the names on the page. Look at the very top line to find the other digits. 5) If you find a matching entry and want to locate the corresponding record on FamilySearch but haven't been able to pull it up there before searching the name, try searching for other names on the register page. If you can find a close certificate, you should be able to easily navigate to the right one. If the birth certificates were assigned numbers when they were entered in to the registers then I think it’s unlikely that many were missed. If a certificate didn’t have a number, it couldn’t be filed away. And as long as a birth was recorded under the proper first letter, then it should be possible to pick out a match in the register even if the name is badly misspelled. 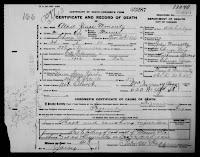 Based on these two assumptions, if you don’t find a matching entry in the birth register, then it’s very likely there is no birth certificate to be found on FamilySearch.